Neutral colors in the kitchen create a timeless look that will never go out of style. Trends come and go, persona styles can change and grow over time, but timeless design is, well, timeless! Choosing a timeless kitchen design is incredibly smart when remodeling your kitchen, as it will suit you and any future inhabitants of your home. How can you create the perfect timeless kitchen design for your home? Cabinets are a major part of your kitchen, and choose a timeless design for them will allow you to be a little more creative with other aspects. Opt for a transitional look that features simple door styles. Don’t be tempted by overly decorative styles or too-sleek contemporary styles. Shaker style or a shaker style with an ogee edge will be perfect for a timeless kitchen design. This allows you to dress up your kitchen for a classic traditional look or dress it down for a more contemporary or rustic feel. 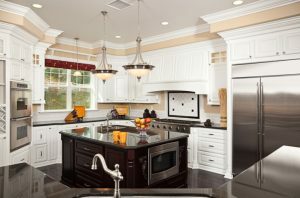 Why are you remodeling your kitchen? If you are remodeling as part of the process of preparing to sell your home, you want to choose something that will appeal to a wide variety of buyers and their styles. If you are remodeling your kitchen to make a little extra space for some new additions on the way, you might want to have a larger fridge or have a dedicated homework or play space. If you are remodeling your kitchen in preparation for spending your retirement baking and enjoying your home, take potential mobility challenges far in the future into account now. This is another place that you should focus on the word timeless when sorting through options. Many tile and countertop trends float in and out of popularity, but there are some that have stood the test of time. It’s hard to go wrong with a neutral palette of subway tile and marble, granite, or a neutral quartz countertop. This entry was posted on Friday, January 6th, 2017	at 3:42 pm	. You can follow any responses to this entry through the RSS 2.0	feed. Both comments and pings are currently closed.